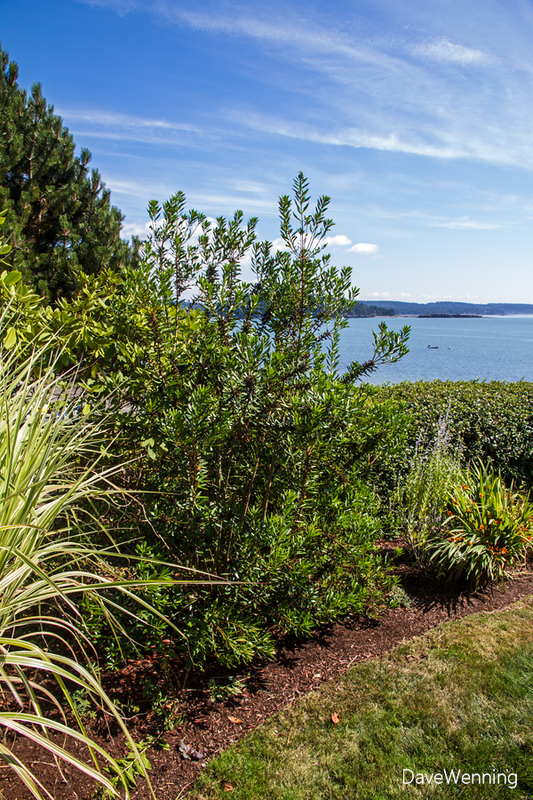 Wildlife and native plant gardeners are always on the lookout for plants to add to the home habitat. 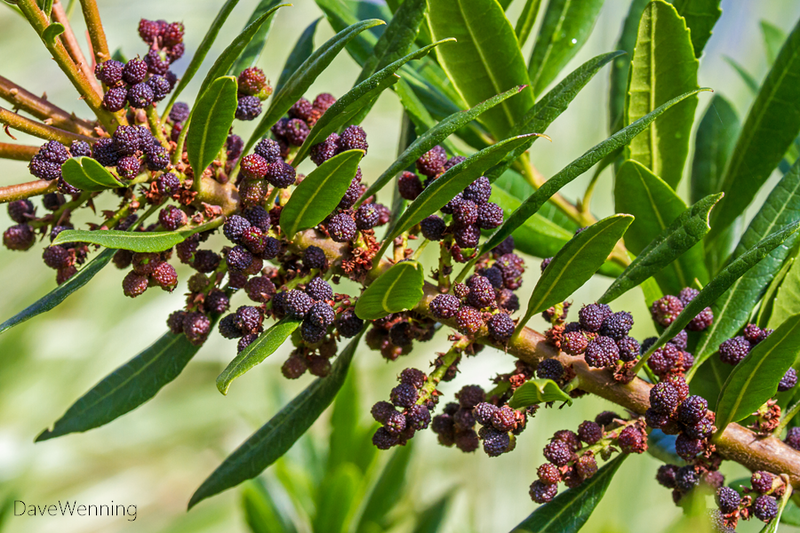 In the Pacific Northwest, the California or Pacific Wax Myrtle (Myrica californica) appears to be a nice choice. 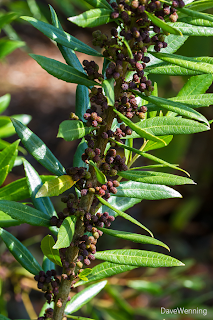 The evergreen shrub grows in a narrow band along the Pacific coast from spots on Vancouver Island to the Long Beach, California area. In Washington this includes the coastal strip between the Quinault Reservation and the Columbia River. Two summers ago, I planted one as an experiment. Pacific Wax Myrtle appears to be highly adaptable regarding sun exposure and soil conditions. Mine is growing in glacial hardpan with a lot of clay and must tolerate summer drought. It gets full sun until late afternoon and appears to enjoy its seaside location. In its third summer, the shrub is almost 8 feet/2.4 meters tall. The height and evergreen foliage make a neat and attractive screen planting as well as a beautiful specimen plant. In the wildlife garden, those purple fruits are its primary appeal. This is the first season mine has borne fruit, but last year's stems are absolutely loaded. Apparently, the flowers don't amount to much. For the life of me, I did not even notice it was blooming. But now in late summer, the fruits are spectacular. I will have to watch it more closely next summer to catch the blooms. I have been searching for plants that will attract Cedar Waxwings and the Pacific Wax Myrtle is apparently one that fills the bill. Now that I know they will do well in my yard, I plan to add some more. Then it will just be a matter of waiting for the birds to find them.